They think it’s all over…for the Three Brians On Me Shirt competition on Facebook, it is now. It’s safe to say that Baddiell and Skinner would love our Three Brians Euro 2016 competition 20 years on. Hundreds of contestants like you certainly did – we received over 600 entries. After finalising the selection process in Zurich, we’re pleased to announce the home kit goes to… Sarah Ann Wright! 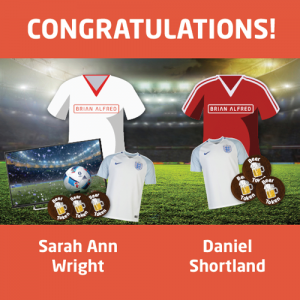 She’ll be in the same group with the winner of the away kit, which goes to… Daniel Shortland! Congratulations to both, and thanks to everyone who took part. If you check the Facebook feed below, you’ll be able to find some of the more lovable parts of our campaign. We thank everyone again for taking part, and are glad to have shared Euro 2016 with you. Baddiell, Skinner and two prize winners. Nice one, Brian!